Nature's Palette - Illustration store PicsForDesign.com. PSP tubes, PSD illustrations, Vector illustrations. The beauty of the leaves falling from the trees and the brisk wind whistling by are just some things you will find in this kit. 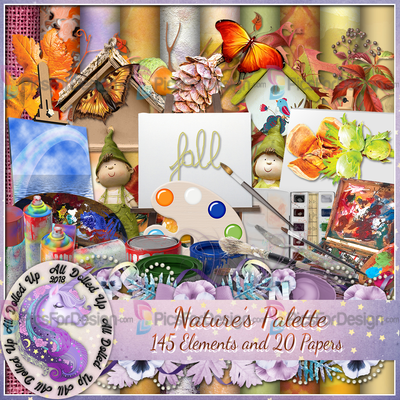 With 145 elements and 20 papers this kit will have you painting nature's beauty in no time. Not all elements are shown in preview. For personal use only.